We could dig deeper and wonder why as adults we are often drawn to tell the negative interpretation of the story of our lives. Maybe it has to do with the pessimistic view of their lives many were handed by their parents? (Though it’s helpful to ask ourselves if we really want to hand that tendency to our children.) Why are we drawn to tell people all that is wrong with what we see rather than acknowledge much that is right? Does it make us feel better, smarter? It’s fascinating stuff but let’s save that rabbit hole for another day. I just wanted to plant that seed. Today let’s keep our focus on ways we can support our teens and help them write a different story—their own story. Not a shadow of ours. Back to the rather cynical “if only” recollections. Although I am suggesting that we as parents try to avoid projecting our personal experiences too deeply onto our teens, I don’t mean to imply that we keep our thoughts to ourselves and leave them to figure out the world on their own. Far from it! Parents have experience and wisdom to share that can be very helpful. Yet to be truly helpful, it’s important that our teens receive it in the “no strings attached” spirit we intend, or else our motivation is suspect and the information understandably discounted. So the atmosphere of communication is important—the relationship. Conventionally, relationships with teens are painted as either/or: either you focus on maintaining authority (tough love) or you avoid challenges altogether (let them run wild). Yet unschooling families have found the beauty of living inside the spectrum of those extremes. We continue to cultivate the strong and connected relationships we have built with our children over the years—it’s a relationship paradigm that serves us well no matter our children’s age. Let’s look at some of the ways unschooling parents view relationships differently and what that can look like in the teen years. Notice how they all boil down to how we relate to them: as people, not possessions. Unschoolers don’t share their experiences or perspective with the expectation that their teens will reach the exact same conclusions. That’s hard, isn’t it? We know what we know! To us—for us—our experiences are fact. For me, it’s a kind of philosophical detachment. Not a detachment as in disengagement, but in appreciation of their individuality. Almost paradoxically, when I’m not living my life through them, I feel even closer to them, because it’s not about me—their life is theirs to live—so I can detach from the outcome and drop my expectations. They are not younger versions of me but unique beings in their own right. So though the experiences I share may be helpful to them, useful pieces to the puzzle of their life, I don’t expect my stories to mean the same things to them: we are each building different puzzles. Speaking of different puzzles, take a moment to realize just how different their childhood has been from our own. The pace of change has been accelerating at breakneck speed over our lifetimes. This is a new thing! Comparatively, the pace of change from one generation to the next even just a few decades ago was almost negligible. What an interesting time in human history to be living! But it also means that the passing down of generational experience is more about bigger picture human issues, like empathy and morality, than any day-to-day advice to “do this and get that outcome.” The nuts and bolts of our stories are often no longer applicable because the world is changing so rapidly. For example, even mainstream society is starting to question the typical counsel to “go to college and get a good job at a big company.” That was the conventional definition of success in the industrial age, and even deeply into the information age, but we are swiftly moving beyond that now. That advice, so adamantly passed on to us by our parents, has become hopelessly out-of-date as our teens move into the adult world. This can be a hard one too. We have more life experience. We remember a time when they were young children and totally dependent on us and we came through for them—here they are! Yet we can also acknowledge that we don’t always know what they are thinking and feeling, how they are experiencing and interpreting the day-to-day moments of their lives. Sure, maybe we really enjoyed camping at the lake as a family over the last long weekend, but that doesn’t mean they did. And they are not “wrong” to have disliked it. Different personalities and outlooks are just that: different, not wrong. This seems to be at the crux of so much parent-teen conflict. At some point, teens are ready for more responsibility, more independence, more freedom. Yet so often parents are determined to keep them in that conventional childhood box as long as possible, the box where parents are right and their children need to do what they’re told. With this new perspective—that their childhood environment is radically different than ours, that they are experiencing life in their own unique ways, and that our expectations are entangled with our life experiences—it is presumptuous of us to believe that our worldview will fit neatly into their lives. What was right for us (or what we imagine would have been right for us), may not be right for them. Just because they are our children, they are not our possessions. They are people. And just because they are our progeny, doesn’t mean we intimately understand them. We need to get to know them. And be open so that they get to know us. Build lasting relationships. And from there we have lasting impact on each others’ lives. My kids have inspired me countless times! I have learned things from them that have made me a better person. We continue to learn from each other. Thank you do much for this! This is so true. And I do see the irony of wishing I’d known this when my kids were teens. It applies, of course to our relationship with our adult offspring as well. Thank you for reminding me that we are each our own selves and that we are always learning. You’re welcome, Georgia. And you’re right, it really does apply to relationships across the ages. Thank you for your articles, especially those about teens. While we have always raised our son a bit unconventionally, we only started home-schooling/unschooling when he was 13. It has been two years now, and it has been an amazing journey. We are walking by faith, often filled with self-doubt (especially since our life look so much different than the lives of others–and how hard it is not to compare! ), but we can’t deny the blessings that have already been reaped. I know we are on the right path, but your advice and counsel are invaluable, and seem to come just when I need them the most. Thank you. I am blessed to read your words. Though my kids have homeschooled, my youngest (14) has led the way to unschooling since he was 2! His personality seems to demand it. Unfortunately, it took me many years to catch up and this is my first year of truly learning to shift our relationship to an even more unconventional one than it has been! It can be uncomfortable at times but I’m a learner! Yes. 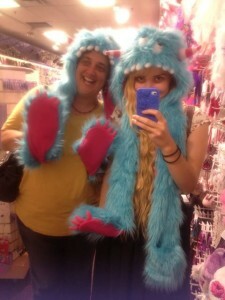 And might I add and another consideration for parents of teens to take note of? Knowing that they teens have different needs in regards to their sleep patterns is so important to respect. Thank you for this article, shared and liked! 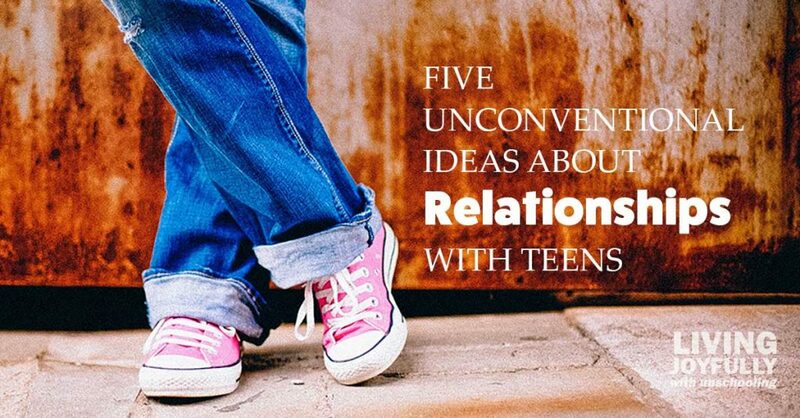 I think these five basic but unconventional relationship ideas are pretty fundamental to maintaining strong and connected relationships with our teens, and into adulthood. Yet, as you say, how they play out individually in unschooling families can definitely look very different! I love your point that you see a greater variety between unschooling families than more conventional families—that’s my experience as well.